The B-Meg Derby Ace Llamados got their 7th straight win against the veteran team, Barako Bull via a whisker 1 point lead, 91-90 yester in PBA Season 37 Saturday Showdown. Mark Barroca, who shot the ball with full confidence in front of the more veteran defenders of the Barako Bulls, earned 18 points and 3 rebounds for this match. His pretty performance enabled him to get the best player of the game award. The Barakos almost got drowned as they were struggling to score on the offensive end in the first 3 quarters of the match while B-Meg's prized rookie, Andy Mark Barroca paraded a perfect field goal percentage in the first 3 quarters. 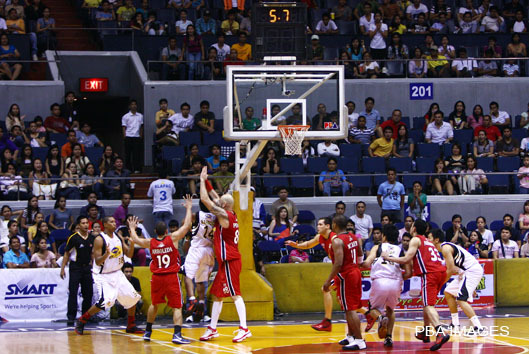 Barroca's great shooting stretched their lead to a two-digit mark. But Danny Siegle found his touch in the paint as he put a 15-4 run with 6 mins. remaining on the clock that slashed their two-digit deficit down to 1 point. The final minute of the match became crucial for both teams. Fouls were called for the Llamados to prevent the Bulls to sink another basket. Yet, Willie Miller was unstoppable and he succesfully put his easy 2-points that made them possess a 1-point lead that forced the Llamados to call a time-out. As the last shot clock time running for the Llamados, Barroca, with his breathtaking shot, successfully sank another 2 pointer that pressured the Bulls to score in the late game, but in the end they failed. Thus, B-Meg won by a whisker.